Sam and Dean must be the luckiest guys on television. Season after season they survive all kinds of supernatural forces — while also avoiding the ratings grim reaper. The 12th season will begin airing on October 13th on The CW but you can try to win season 11 on DVD now. The set contains all 23 gripping episodes from Season Eleven and is packed with over four hours of bonus content – including featurettes, commentaries, the show’s packed Comic-Con panel, deleted scenes, and a priceless gag reel. 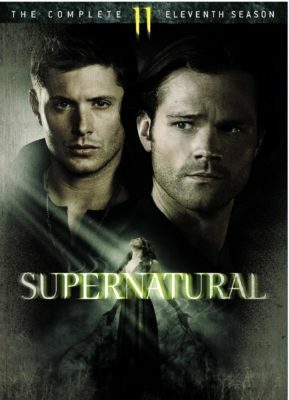 Season Eleven plunges Sam and Dean Winchester (Jared Padalecki and Jensen Ackles) into extreme peril as they face The Darkness, a sinister new menace unleashed upon the Earth. They continue their monster-hunting missions, battling the usual werewolves, black-eyed demons and even a vengeful ghost in a stuffed bunny costume, but with a sharp new focus: destroy The Darkness. Needing all the help they can get, the brothers turn to fallen angel Castiel (Misha Collins); the King of Hell, Crowley (Mark A. Sheppard) and even an unassuming God (Rob Benedict)– only to come face to face with Lucifer and Crowley’s power-hungry witch-mother Rowena (Ruth Connell). Strap yourself in for the Winchesters’ darkest adventures yet as they journey between Heaven and Hell in all 23 electrifying episodes of the epic suspense thriller. The DVD set goes on sale on September 6th and sells for $49.99 (less on Amazon) but you can try to win one of five copies here. To enter this contest, you need to merely post a comment below with the name of a favorite character or memory from past seasons. You may enter only once. Be sure to include your email address in the appropriate spot so we can contact you if you win. Guidelines: This giveaway is open to participants with a physical United States mailing address only. (Sorry, no P.O. Boxes. International readers can enter if they have a friend in the States who can accept their prizes by mail.) Many may enter but one person will win. You must be 18 and older to enter and no purchase is necessary. The contest ends September 29th and the winners’ names will be posted here the next day. Good luck! Update: Congratulations to Ronald, Serena, Rick, Mike, and Laurie who won this contest. Thanks to all who played! More about: Supernatural, Supernatural: canceled or renewed? Supernatural: Will Jensen or Jared get “Baby” When The CW Series Ends? Supernatural: Will Season 14 Be the End for the CW Series? Supernatural: The Stars and Creator Want It to End? No Season Six? Although my fav is torn between mystery spot ? (our 1st & the 1 that got us hooked) & the French Mistake. !! I think a fav. Moment, would have to be the 1 time Dean got to be a reg. kid & Bobby took him out to throw a ball around w/ him !! Despite John’s wishes that he taking him to practice shooting !! Funniest moment has to be the bros.trying to act in the French Mistake. !! Favorite was Rachel Miner as Meg. BUT I Love every one on the show. There was to many excellent scenes to declare a favorite! My favorite moment was when Dean screamed at the cat!! THAT WAS SCARY! My favorite character is Crowley! The CSI:Miami spoof was great in season 5 episode 8, was great. I wish they could have actually used the Won’t Fooled Again song as they do for the CSI Miami show intro…that would have made it perfect. The reference to the Corey Hart “Sunglasses at Night” song was also a great touch. Bob Singer, oh how I miss that man. Azazel is a favorite evil character from the the series! Dean followed closely by Castiel and Crowley. Love this series, even through the couple of bad seasons. I do hope they do some more comedic episodes and do some more just plain hunting.